[CONT3] allies, the UK & Netherlands, that these two acts of heinous murder were committed by elements working for or in the Russian government? And 2nd, Mr. Putin, what on behalf of the Russian people do you have to say to the British & Dutch people regarding these incidents? Hacking attempt disrupted on 13th April. Four Russian officers were escorted out of the country on the same day. Dutch Defence Minister says this pubic disclosure is an "exceptional" step but is being done to hamper operations and send a message. Trump’s already spewing Kremlin talking points & he hasn’t even entering the room with Putin. RUSSIA attacked our election, invaded Ukraine, stole Crimea, propped up dictator Assad in Syria, poisoned people in UK. 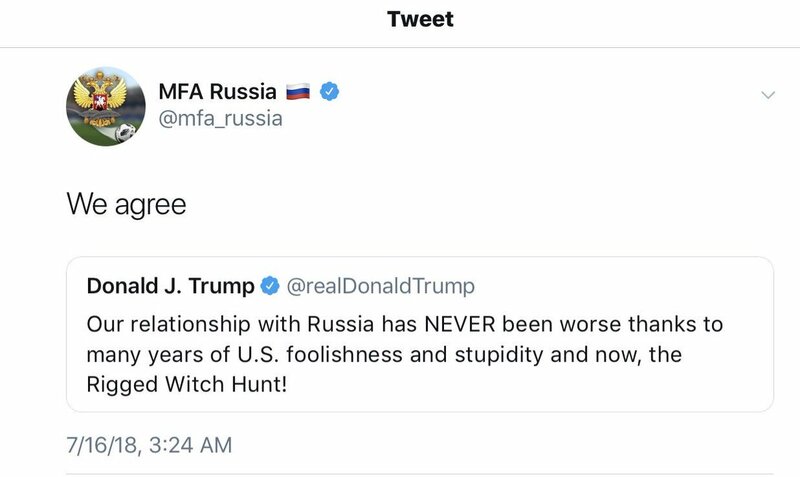 “US foolishness & stupidity” is having #HelsinkiSummit with Putin.